Currently, the most fashionable Conspiracy Theory of History is that there is an international secret society, the Prieuré de Sion, that has been behind many world events over the past thousand years, that a French priest in the village of Rennes-le-Château stumbled upon their secret over a hundred years ago and that the Prieuré is protecting a family lineage that can be traced back to Jesus of Nazareth and Mary Magdalene (who were married, in case you didn’t know). It’s all there in secret documents in the Bibliothèque Nationale in Paris, so it must be true! 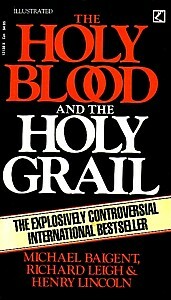 In a book published in 1982, authors Michael Baigent, Richard Leigh and Henry Lincoln claimed to have uncovered a massive international and long-running conspiracy, involving the church, cultural and military leaders, a bloodline descended from Jesus of Nazareth and a secret society, the Prieuré de Sion, behind many of the major events of the past thousand years of European history. Their book – The Holy Blood and the Holy Grail – built on three television documentaries researched by one of its authors, Henry Lincoln (real name Henry Soskin, born 1930), which were broadcast in the 1970s. 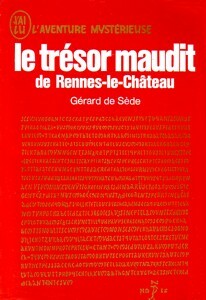 These, in turn, had been based in part on L’or de Rennes (‘The Gold of Rennes’), a book published in 1967 by the French writer Gérard de Sède (1921-2004), and proved an international success. It began with an investigation into a minor local mystery first brought to a wider public attention in France by de Sède. The mystery was how was an obscure country priest, Bérenger Saunière (1852-1917), was apparently able to spend vast sums of money in the years around 1900 refurbishing his parish church at the remote village of Rennes-le-Château in Languedoc, south-west France. De Sède developed the thesis that he had stumbled upon a secret that could rock the very foundations of western civilisation. The secret? That Jesus had fathered at least one child and that his descendants continue to operate behind the scenes, influencing the course of European history through the machinations of a secret religious order, the Prieuré de Sion, a secret society originally founded in Jerusalem during the First Crusade. In a follow-up book, The Messianic Legacy, the authors claimed that the then Grand Master of the Prieuré, Pierre Plantard (“de Saint Clair”, 1920-2000), was aiming for a restoration of the Merovingian dynasty to rule not just France, but to take on a monarchic role in the running of the European Union. This was to be achieved by popular consent, with Pierre Plantard or some other Merovingian claimant taking the responsibility for ruling. Baigent, Leigh and Lincoln’s works bear a superficially impressive critical apparatus, with extensive endnotes and bibliographies, demonstrating a huge amount of research, much of it using obscure and unpublished documents and sometimes popularising the work of serious academics, such as the biblical historian Robert Eisenmann. Their research deals with characters who were once famous but who are now little known outside specialist histories, such as Godfrey de Bouillon or René d’Anjou. Their statements are well documented, so why would any historian disagree with their conclusions? Like so many such adventure stories, it unravels very quickly. We know the source of Saunière’s ‘wealth’: he was suspended from his priestly duties after being found guilty of selling masses and receipts exist for a short period in the 1890 that show the income generated was respectable, although not vast. Through a series of advertisements in predominantly royalist newspapers and magazines, he solicited money for the promise of saying a mass on behalf of the donor. Several of his account books have survived, showing that it would have been impossible for anyone to say even a fraction of the masses he was being paid to deliver. The failure of Baigent, Leigh and Lincoln to recognise the source of money is symptomatic of the superficiality of their research and their lack of critical judgement. Firstly, the research may have been wide ranging, but it was scarcely critical. In particular, the documentation they cite for the Prieuré de Sion is based entirely on some documents deposited in the Bibliothèque Nationale in Paris between 1956 and 1969. These documents turn out to be typescripts and scrapbook collections, emanating from a small group of people who are implicated in the ‘conspiracy’ the authors believe they have uncovered. At only one point do they stop to ask themselves if they are the victims of a hoax, only to conclude that they are not, on the grounds that such a hoax would have to be carried out over many years and was too elaborate to be plausible. It is difficult to believe that many people would agree with their analysis: the sheer implausibility of the information these dubious documents are supposed to contain (for instance, that the Grand Masters of the Prieuré de Sion have included such characters as Sir Isaac Newton, Leonardo da Vinci and Claude Debussy) is such that any careful historian would search for evidence to back up these assertions, but they have been unable to find any whatsoever. The whole thing comes down to trusting the typescript documents. The story should end with the revelation that Saunière’s alleged ‘wealth’ was short-lived and easily attributed to his illegal sales of masses. However, it caught the zeitgeist of late twentieth-century conspiracy theory and was given a new lease of life it does not deserve by Dan Brown’s phenomenally successful novel The Da Vinci Code, which became the best-selling work of fiction of all time. It is clearly heavily indebted to the improbable scenario hypothesised by Baigent, Leigh and Lincoln in The Holy Blood and the Holy Grail, but weaves their quasi-historical musings into a suspenseful tale of murder and intrigue. Dan Brown’s insistence in his introduction that the historical documents and events he has used to create the background to his story are all factually correct have been taken at face value by many, even most, of his readers. It may be that he believes that the Prieuré de Sion is a real and venerable, if sinister, institution. At any rate, his fiction has inspired many to look more deeply into the supposed mystery of Rennes-le-Château. This is where the Bad Archaeology really impacts on the story. While Baigent et al. were content to make assertions about the past of the village, they seem never to have been really interested in these aspects of the story, as they became increasingly drawn into the web of fantasy maintained by Pierre Plantard. Nevertheless, it has become an unfortunate aspect of the resurgence of interest in the tale that numerous unauthorised excavations have taken place in and around the village. It is not always clear what the excavators are looking for. It may be that they believe the ‘lost treasure of Jerusalem’ is buried somewhere close to the village; they may be seeking the body of Jesus; they may be searching for clues overlooked or defaced by Saunière. Whatever their motive, they have prompted the local authority to place notices warning that les fouilles sont interdites (‘excavations are forbidden’), as graves in the village cemetery have been desecrated in these random searches. I watched both movies made by the authors and there is some compelling evidence for some of what they say, but none of it regarding the Priory of Sion is even remotely true. The Rosicrucians published a list just before the supposed documents appeared in the Biblioteque which listed as their leaders over the centuries many of the people on the Priory list. So, it was just a copy of the list made by the Rosicrucians with a few additions. I read The Holy Blood and The Holy Grail and it would seem that they were probably cooperating with Plantard so they could all make money with a hoax. The whole thing is also based on supposed connections with the Masons and the Templars, which is tenuous at best. I have studied all the degree of the Masons and mostly they are Jewish myths, mixed with a very little alchemy and the Rosicrucian Degree has nothing to do with the real Rosicrucians, but is merely some mythology. There is really nothing very secret in the Masonic degrees and very little esoteric knowledge. As I iterated, it is mostly Jewish myths that would not have been allowed to have been talked about in the 18th century openly, but without knowing the source of these myths it is uncertain what the veracity of them is. There are other Chronicals that exist of the Jewish legends that are in fact better and more interesting. The main thing that happens with the Masonic degrees is that you dress up, act out a little play which is usually about some obscure person from Jewish legends and then you are asked what you learned, but you have a script in front of you which you read. And then they threaten you to tear out your heart or some souch thing if you reveal the secrets of the degree. And that is all there is to it. The Rosicrucians are a school and the work is similar to other orders, such as Buddhists, or Hindus where you learn about meditation, healing practices, Yin and Yang, which they call the positive and negative vital force and it’s manipulation and a variety of other more modern concepts. They have no political agenda and any one can take the lessons and enjoy the rituals which are based upon and are very similar to the ritual of the ancient Gnostics. The rituals were extant long before the Nag Hammaddi Library was discovered and so are genuine and therefore based upon ancient knowledge. Whereas, the most ancient record of the Masons is about 1350 when the King of Scotland was supposed to have given Sinclair the right to initiate men into the first three degrees of Masonry which are about the building of the Temple of Solomon and the murder of Hiram Abiff. His body is cut into twelve sections and then is rediscovered. This is jsts a retelling of the myth of Isis and Osris. Of course after you take their degree you are threaten with your life if you reveal their secrets. There is ancient teachings in the Rosicrucians, but it is nothing like what the Masons do. The Masons are not a school and they learn nothing of importance which is secret. The amin reason to keep it secret is so that they can dupe more candidates into paying the money for the degrees. The 33rd degree is only the symbol of the Masons with a 33 in front of it and that is all there is. This must just say to the candidate you have been royally scammed. Having been enthralled by HBHG on its first publication, then later backing away as its many claims withered under scrutiny, I still find myself in support of at least one of the assertions made by the writers’ (now, sadly, all departed this life). And that is that Jesus – if he ever existed and there is corroboration of that which is independent from the Bible – would hardly have reached adulthood in his community without having married. A middle-class man (don’t forget his descent from King David – no poor carpenter this) would have had a wife and a whole pack of children. I feel that is a reasonable assumption. Taking the permitted Gospels as evidence – a dubious practice, I know – there is no better candidate for the role of Mrs Jesus than Magdalene. As for their post-crucifixion adventures, that cannot be more than speculation. I should, of course, have written: “if he [Jesus] ever existed and there is NO corroboration of that which is independent from the Bible”. The worst typo has to be omitting the negative. Did Pierre Plantard bottle it, or was he acting under orders? Who was Plantard more afraid of, the secret society or the authorities? Opponents, academics, and so called serious historians must have thought the Prieure De Sion, and the Da Vinci code was dead and buried. Plantard was some kind of fantasist, joker, hoaxer, or surrealist, plus he had a criminal record. Under tough questioning from French authorities, Plantard apparently confessed it was all a hoax. He said that De Sion only ever had three members, himself and two mates who did it for fun. It struck several commentators at the time, as rather odd that three grown men would set up a secret society for fun. Bored men take up golf, or in mad moments hang gliding, or even resort to something as boring as stamp collecting, or as eccentric as train spotting. But a secret society? How many men get out of bed one morning and say to their mates, I know, why don’t we set up a secret society? And his two mates said yeah, great idea, it really be such “FUN”. So historians had shot the Da Vinci code full of holes, The De Sion was an out and out hoax. For a while the De Sion seemed to vanish into thin air. But De Sion had not vanished into thin air. People dismissed the very idea of even looking for them. If they did still exist they had got themselves the biggest possible advantage any secret society on Earth could have wished for, ultimate secrecy, near invisibility. Even the people searching for it, would be dismissed as crazies for even bothering to search. In 2010, a certain man took a phone call. His caller said you aren’t going to believe this, De Sion are active. The man said, De Sion active? You’re putting me on? That’s impossible! It’s not April the first. Between 2010 and 2014, somebody was going around giving a very good impression of being the De Sion. Somebody was going around impersonating the De Sion. They must have been out of their tiny minds. Academics had all but demolished the story. What on Earth did they think they were up to? So obviously just a bunch of cranks right? Except that these cranks were making announcements weeks, sometimes months in advance, that would later become government policy. O.k cranks with friends in high places, and a bit of influence, but still cranks right? Surprisingly well traveled cranks. Africa, South America, Canada, France, Russia, England, Ireland, Switzerland, the United States. Some of them had money, and could take a lot of time off work. A Miss Red and a Miss White met a Mr Blue at the Dorchester Hotel in England. Mr Blue claimed to be from De Sion. A later meeting quickly followed, in a stone building with wooden floors, and quality wooden furniture, and a few paintings in the room. Mr Blue said, we have old documents, but I wont show you those. Because they are all fake. We could have gone to the bother or prematurely aging them. At least that’s what the historians would say. So no, all the documents I show you are mostly from the nineteen sixties. Mr Blue shrugged his shoulders and waved his hand. Of course even the ones from the nineteen sixties are a tissue of lies. We do this for our hobby you know. Some people collect classic model cars and such like. We are respectable family men. Our hobby is to tell a pack of lies. We like to waste our time play acting like this. Plantard was a bit of con man. He conned us out of thirty five thousand Swiss francs. He led us up the garden path as well as others. No grand master of the De Sion would ever have the blood. Do you think they would make them self a kidnap target? All grand masters are trustees only. Plantard, we turned the tables on him. Do we hate him? Not really, he is what you English call a lovable rogue. You know, he actually did us a favour. You know he kind of played the Judas role. We hold Judas in rather higher esteem than most ordinary Christians. Even Christians are aware that without Judas, there would be nothing, Judas was vital to the project. Judas acted with the tacit approval of Jesus and others. You know, Judas might actually have protested at his role? Who else would have done it? Plantard partly lied to the authorities, even under oath. He was more afraid of us, than of them. But that is not all, I wonder if he did it because he actually ended up being loyal to us. There are other things you must see. My car will take you to the HSBC Bank. Miss Red and Miss White were chauffer driven to an HSBC Bank. Bank staff treated Mr Blue with a reasonable respect, but only as they would do with any usual business type. You can argue about the authenticity of the documents all day long. Even the ones from the nineteen sixties. But you can’t argue with the money they have. Whatever it is exactly, this Prieure de Sion has millions. Absolutely millions. Mr Blue said, Dan Brown might have been not too far off the mark. A married with children Jesus, in no way has any bearing whatsoever on his healing powers, his supernatural abilities so to speak. Plantard had form as a con man. While their story is entertaining I agree it lacks credibility . Often they use other conspiracy theorists as references and in turn these theorist cite them.